Range of 500 thread count 100% Egyptian cotton bedding with a satin finish. Soft and luxurious. Connie Home always offers the highest quality bed linen to our customers. With the 500 thread count bed sheets of the Provence collection we are providing the best of the best. Perfect for anyone looking for the softest and strongest option with their luxury bedding. For that reason we provide duvet covers, flat sheets, fitted sheets and pillowcases made from 100% natural Egyptian cotton woven with a high 500 thread count. These number of threads per inch creates an exceptional quality bed linen, characterised not only by the durability over time, but the softness of the bedding. The pure white colour will dress your bedroom with a beautiful natural look, helping to make your sleep both relaxing and rejuvenating and giving you a kick start to the day ahead. Choose your Provence Egyptian cotton fitted sheets from the available range of sizes, single, double, king and super king depending on your mattress. 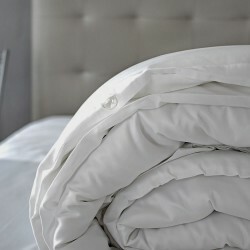 Exquisite pillowcases made from delicate threads of high quality Egyptian cotton with an ultra soft 500 thread count. The softness is particularly noticeable at bedtime due to the lightness and the corresponding comfort you feel when you get to bed. In this top of the range Provence collection Connie Home provides two types of pillowcase; the Oxford style pillowcase with a 5cm border around each edge to create an impressive decorative touch to your bedroom. Also the classic style of 500 thread count pillowcase which manages to appear both elegant and natural. Being made from the highest quality 100% natural Egyptian cotton these pillowcases are therefore free of all synthetic materials. The high number of threads per inch gives the pillowcases great strength, one of the benefits of this 500 thread count is they last for years; even with heavy washing. The white colour generates a natural, luxurious appearance to your bedroom, a look which is very difficult to improve upon. Connie Home is proud to present the flag ship Provence range of duvet covers with a 500 thread count, the perfect choice for your exclusive bedroom. Made from only the best Egyptian cotton to be found in the textile industry, this duvet cover collection is completely natural and of a purity only found in the quality ranges of bed linen. The Provence duvet cover has a completely simple design without any adornments or bordering and it is this simplicity which creates the elegance found in this collection. This type of 500 thread count Egyptian cotton creates the strength needed to last for many years, whilst at the same time staying soft and supple. With a classic button closure system at one end, which is practically invisible and does not distort the line of the Egyptian cotton duvet cover, allowing the duvet insert to adjust smoothly to the outer cover. Available in various sizes to suit the size of your mattress, from single, double, king through to super king. Exclusive range of sheets made from the softest and strongest fabric on the market - Egyptian cotton. These sheets have a slight satin touch which is what gives our sheets their brilliant and silky look; something only found amongst the best bedsheet collections. The aim and philosophy of Connie Home is to provide our customers with the best quality bed linen. For that reason the luxurious 500 thread count of the Provence Collection is at the top end of the quality scale. The pure white satin sheets give a fantastic look of distinction to your bedroom. These sheets are both very soft and at the same time extremely durable allowing you to enjoy their soft, silky smooth touch for many years. The range of 500 thread count bed sheets, both flat and fitted, is available with matching duvet covers and pillowcases. All of which are supplied in the appropriate dimensions for the main UK bed sizes.